Ivory Floral Bouquet Chandelier Shade - Stunningly gorgeous! This ivory dupioni silk chandelier shade is beautifully adorned by hand with silk ribbon and pearls. We recommend a 25-40 watt bulb for chandelier shades. 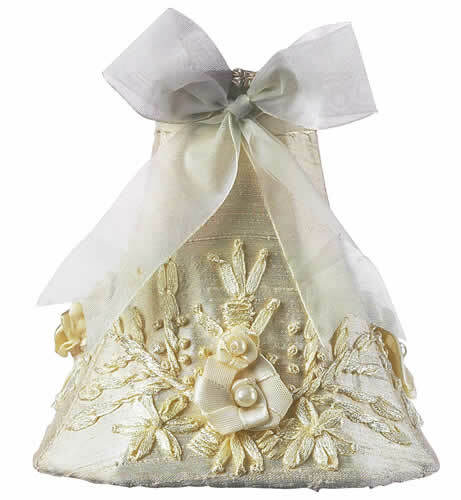 Dimensions: 2.25" x 5" x 5.25"
Full Description Ivory Floral Bouquet Chandelier Shade - Stunningly gorgeous! This ivory dupioni silk chandelier shade is beautifully adorned by hand with silk ribbon and pearls. We recommend a 25-40 watt bulb for chandelier shades.